The first workshop for senior animal welfare representatives in Africa as part of an OIE plan has been hailed a success by the International Coalition for Working Equids (ICWE). Delegates from 24 countries attended the workshop last month, as part of the World Organisation for Animal Health (OIE) Focal Point Regional Seminar for Africa. The practical day was part of the OIE’s week of training for the Focal Points – representatives of Veterinary Services who work on veterinary and animal welfare policy – and was funded by the EU, the government of Lesotho and ICWE, a coalition comprised of working animal welfare charities Brooke, The Donkey Sanctuary, SPANA and World Horse Welfare. A field clinic hosted by World Horse Welfare’s programme in Ha Ntsi, outside of the capital Maseru, provided a practical opportunity to demonstrate to participants how the new OIE Terrestrial Chapter on Working Equids could be applied to improve working equid welfare. Roly Owers, Chief Executive of World Horse Welfare, which currently chairs the coalition, said the charity was delighted with the success of the first full-day ICWE workshop. “This was a vitally important opportunity to put the recommendations in the new Chapter on Working Equids into practical terms and demonstrate how they can be used to improve the welfare of working equids both in Africa and around the world. Four case studies were presented in the morning, demonstrating the role of working equids in four regions of Africa and the typical welfare issues that they may face. SPANA presented on their work in Mauritania; the Egyptian Society for the Protection and Welfare of Working Animals (ESPWWA), in partnership with The Donkey Sanctuary, presented on the Egyptian brick kilns; Brooke presented on the donkey skin trade in Africa, which is a major emerging concern; and World Horse Welfare presented an overview of their project in Lesotho working with the National University of Lesotho, in agreement with the Ministry of Agriculture and Food Security. The case studies generated a lot of interest amongst the delegates and provoked discussion, which continued throughout the rest of the seminar. 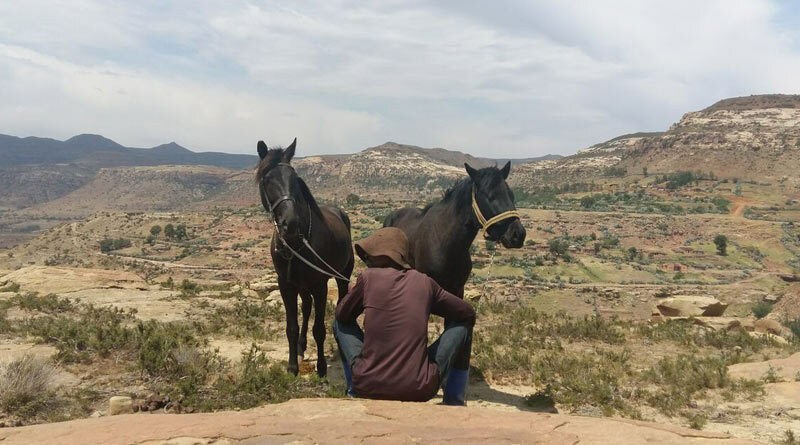 The case studies were followed by site visits to see two communities that the World Horse Welfare team are working with, where the participants met about 300 working horses and donkeys and their owners. The delegates were shown how to make welfare assessments using the new Chapter on Working Equids, to assist the participants in identifying how they would apply these assessments in their respective countries. The welfare of the horses and donkeys in both communities was noted by the delegates to be very good, with an excellent relationship between the equines and their owners.